al., 2015]. Identifying appropriate locations, with an adequate amount of resources will be a major factor for the selection of human landing sites, together with the scientific importance of the site [Horgan et al., 2013]. The goal of this project has been to test the use of remote sensing (performed in various locations) to support In-Situ Resource Utilization. Assessment of mineralogy and temperature readings – via remote sensing – has been performed to provide information about material abundance, water content and thermal inertia. The latter will be correlated to particle size and cohesiveness of the material, which in turn suggests the most appropriate tools to effectively collect the material for processing. Simple collection tools including rock hammers, spoons, and trowels have been evaluated in terms of ease of use, and efficacy of collection of the material, based on the physical properties of the material. The MDRS region, in the Colorado Plateaus, is a good Mars analog, especially in the areas pertinent to the middle Jurassic Entrada Sandstone, the middle and and late Jurassic Morrison Formation, and the Dakota Sandstone. These areas exhibit mudstones and sandstones mainly composed of clays (montmorillonite, illite, and kaolinite, often coated with hematite), strata of paleo-gypsum and other sulfates, and recent evaporites. Most of those minerals are present close to regions of geological interest on Mars, and are dug on Earth for construction and other purposes. Six geologic EVAs have been performed by the crew, visiting the following regions: URC North Site, area East of Greenstone Road, and The Moons (Morrison Formation and Dakota Sandstone); “Boilermaker Canyon”, previously unexplored by MDRS crews (Entrada Sandstone and lower Morrison Formation); Skyline Rim (Mancos Shale). The crew geologist and the rest of the crew collected a variety of samples in these location, and analyzed them with a “PANalytical QualitySpec TREK” portable spectrometer. The 86 Visible and Near Infrared (VNIR) spectra gave information about the mineralogy of the samples, and will be used to assess water content in the various locations. The geologist also measured temperature of rocks and soil at different depths and in different conditions, in replacement of measurements that were supposed to be taken with a thermal camera, which was not received in time for the mission. These measurements will be used after the end of the mission to determine the correlation between thermal inertia and physical properties of the material, such as cohesiveness and bulk size. The geologist used a rock hammer and a trowel to simulate collection of different material, under simulated Martian conditions for what concerns EVA suits and bulky gloves. The EVAs brought the analog astronauts through diverse fields, ranging from plains covered in clays and characterized by salt deposits to deep canyons where million of years of strata are exposed. All the types of terrains are found on Mars, though the presence of large angular boulders is more prominent in most Martian landscapes. Analysis with the portable spectrometer confirmed the presence of mudstone and sandstone, with a few layers of conglomerates, mainly composed of illite and montmorillonite, with some samples of chlorite shales. The iron is almost all present in the form of hematite, thus reducing the occurrence of nontronite. Receding water from the Jurassic Sundance Sea left behind strata of salts in period of dryness. The salt is mainly sulfates, which (together with perchlorates) is present on Mars in various locations of geologic interest. White layers of gypsum, in the form of transparent selenite and white satin spar in the Morrison Formation, are accompanied by pink dikes of manganese sulfate in the lowest strata. Spectra will be further analyzed for water content and impurities. The results were extremely satisfactory, both in terms of Mars analog mineralogy and for what concerns collection of the samples with the various tools, and yielded useful outcomes for ISRU on Mars, described in the last section. The experience in this project at MDRS was twofold informative, on the geology aspect and on the exploration aspect. The crew geologist, as an analog astronaut, had to face various difficulties in this mission: unexpected situations require a certain amount of flexibility. For example, the absence of the thermal camera, which can be considered analogous to an instrument malfunction, required a last-minute change in the details of the research project. Contingent situations, such as weather or communication failures cut short some of the EVAs, thus reducing the amount of time spent in the field, which of course is much less than what would be spent on a field expedition on Earth. Instruments which are very simple to use on Earth, such as the portable spectrometer or a marker to write on the clipboard, are much harder to use when the analog astronaut is incumbered by a space suit and bulky gloves. With much pride, our crew geologist managed to never break simulation, though at times he had to find ingenious solutions to be able to operate his instruments or to reach certain locations. On the other side, all these occurrences suggested ideas for better design of astronaut tools for use on planetary surfaces, where the presence of gravity needs to be added to the bulkiness of the garments (in orbit, astronauts experience the problem of large gloves, but can have a variety of tools just attached to their belts without their movements being made harder by gravity). Areas that require long walks because not accessible by vehicles suggest that surface EVAs will be probably shorter than in-orbit EVA: the crew geologist performed four EVAs in five days without particular overexertion, but a single EVA to Boilermaker Canyon was harder than multiple EVAs, because of the configuration of the terrain and the longer hiking distance. 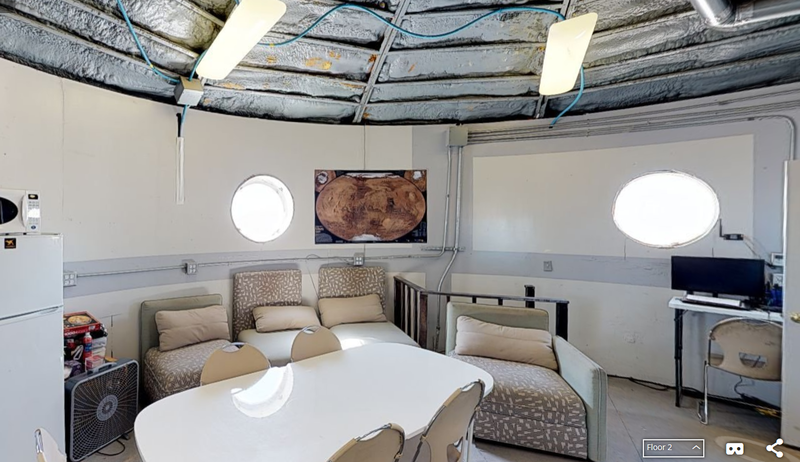 From a geologic perspective, the site also provided valuable lessons: besides the analogies with Martian mineralogy, the MDRS site gave information on how to use remote sensing to evaluate the abundance of the material, and some of the physical properties to facilitate collection. The mission also showed how much variety of material can be found within short distances, which suggests that more detailed surveys of interesting locations on Mars will be necessary to determine optimal places for human exploration and activities. 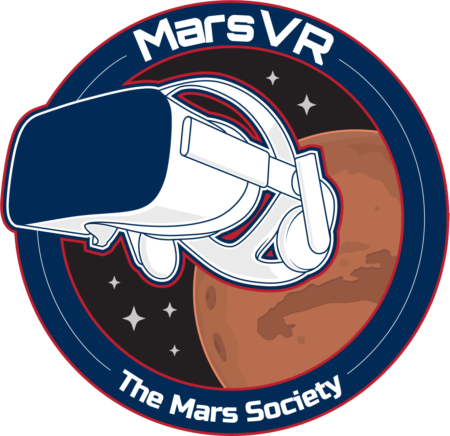 In conclusion, despites all the limitations to the fidelity of the simulation (gravity and atmospheric conditions, not-airtightness of the habitat and the space suits), the crew managed to achieve an adequate level of Mars analogy in the geologic EVAs. 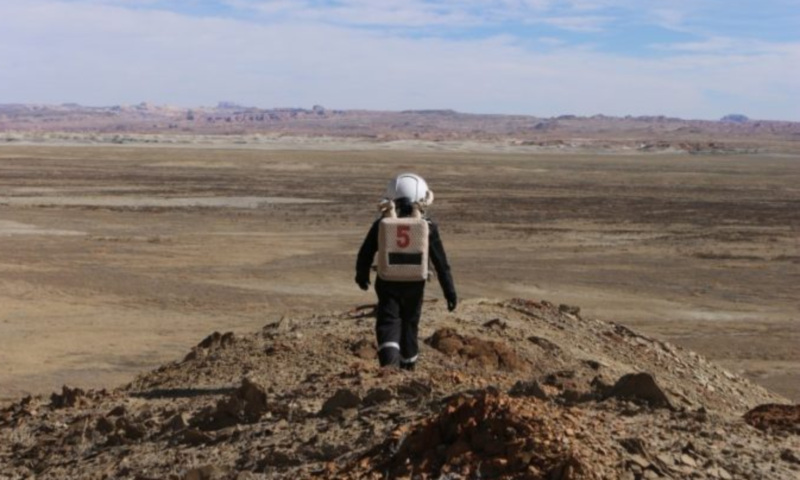 The landscape, the colors, the cumbersomeness of the suits, and the attention given by the crew to simulation details gave the impression of being exploring Mars and added to the challenges of the experience, producing outstanding results. Clarke, J. (2003), The regolith geology of the MDRS study area, report. Cooper, J. (2002), Mining Mars, CMA Management, September 2002, pp. 38-41. Cuadros, J., and J. R. Michalski (2013), Investigation of Al-rich clays on Mars: evidence for kaolinite-smectite mixed-layer versus mixture of end-member phases, Icarus, vol. 222, pp. 296-306. Curreri, P. A., and D. R. Criswell (1999), In situ production of solar power systems for exploration: potential for in situ rectenna production on Mars, AIP Conference proceedings, vol. 458, pp. 1623-1628. Gundlach, B., and J. Blum (2013), A new method to determine the grain size of planetary regolith, Icarus, vol. 223, pp. 479-492. Hargitai, E., ed. (2008), MDRS unofficial expedition guide, technical report by MDRS crews 42 and 71. Horgan, B., J. A. Kahmann-Robinson, J. L. Bishop, and P. R. Christensen (2013), Climate change and a sequence of habitable ancient surface environments preserved in pedogenically altered sediments at Mawrth vallis, Mars, 44th Lunar and Planetary Science Conference. Jones, E., G. Caprarelli, F. P. Mills, B. Doran, and J. Clarke (2014), An alternative approach to mapping thermophysical units from Martian termal inertia and albedo data using a combination of unsupervised classification techniques, Remote Sensing, vol. 6, pp. 5184-5237. Muscatello, A. C., and E. Santiago-Maldonado (2012), Mars in-situ resource utilization technology evaluation, 50th AIAA Aerospace Sciences Meeting Including the New Horizons Forum and Aerospace Exposition. Presley, M. A., and P. R. Christensen (2010), Thermal conductivity measurements of particulate materials, 4. Effect of bulk density for granular particles, Journal of Geophysical Research, vol. 115 no. E07003. Sacksteder, K. R., and G. B. Sanders (2007), In-situ resource utilization for Lunar and Mars exploration, 45th AIAA Aerospace Sciences Meeting and Exhibit. Sanders, G. B., and M. Duke (2005), In-situ resource utilization (ISRU) capability roadmap executive summary, NASA report. Sanders, G. B., and W. E. Larson (2015), Final review of analog field campaigns for in situ resource utilization technology and capability maturation, Advances in Space Research, vol. 55, pp. 2381-2404. Wan, L., R. Wendner, and G. Cusatis (2015), A novel material for in situ construction on Mars: experiments and numerical simulations, Northwestern University Center for Sustainable Engineering of Geological and Infrastructure Materials (SEGIM) internal report.